During the summer months, stargazers can see the famous Summer Triangle almost directly overhead. 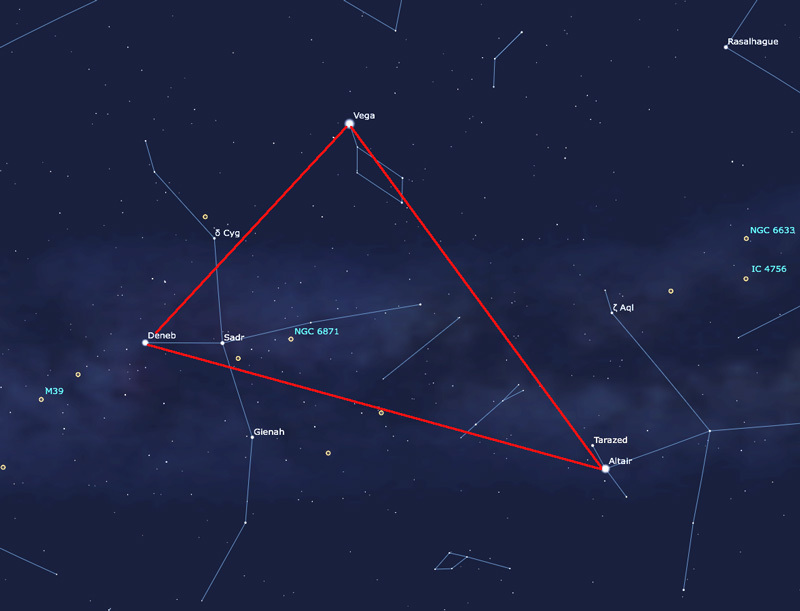 The triangle is a giant asterism created by drawing imaginary lines between three bright stars — Deneb in the constellation Cygnus, Vega in the constellation Lyra, and Altair in the constellation Aquila. Deneb is a blue-white super-giant that is almost 200 times larger than the Sun and 60,000 times brighter. At 1,500 light years distant, it is one of the most luminous stars known and is the farthest first-magnitude star from Earth. It has a solar wind that is 100,000 times faster than the solar wind from the Sun. Vega is a blue-tinged white star that is about 25 light years away. It is twice the mass of the Sun and about 37 times brighter. At 16,000-degrees F, its surface temperature is almost twice as hot as the surface of the Sun. With the exception of the Sun, Vega is the first star to have been photographed. In 14,000 years, it will replace Polaris as our north star. Altair, at a distance of 16.9 light years is about 1.5 times larger than the Sun, and is one of the closest stars visible to the naked eye. Altair spins on its axis at about 640,000 mph and completes a full revolution every 6.5 hours. The Sun in comparison takes about 25 days to complete one revolution, as measured at its equator. Altair is spinning so fast that its north and south poles are pushed in, giving the star an oblate appearance. The Summer Triangle was first described as a triangle by Austrian astronomer J.J. Littrow in his atlas in 1866. German astronomer Johann Bode connected the stars in a map in 1816, but did not label the asterism. This entry was posted in Uncategorized and tagged asterism, astronomy, constellations, stars, summer. Bookmark the permalink.